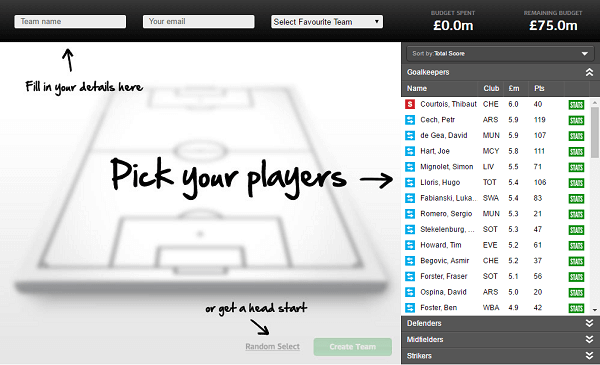 Selecting a Sky Fantasy Football League can appear to be an overwhelming task, but really it isn’t! Every Sky fantasy football coach has the opportunity of choosing a 14-man squad to compete against other teams in the EPL. The squad typically consists of 3 forwards, 5 midfielders, 5 defenders and a goalkeeper. To select your team with some of the popular and performing premier league players, you can go to the player pool that is located on the transfer page, buy your players and bring them onto the team by clicking on them. Once you are done, you can select a League using the various Sky Fantasy Football League codes available online. From the 14-man squad, you will have to ensure that you have selected a total of 11 players by the time the deadline reaches. This team will form your fantasy team. You can choose to play your Sky Fantasy Football team in any formation that you wish as long as you’ve chosen a forward, at least three defenders and a goalkeeper are selected to the first eleven. Only the starting or automatically substituted players in your Sky Football fantasy team will be able to earn you the fantasy points. From the selected 11 players, you are required to nominate one player as a captain and another player as a vice-captain. The captain and his vice can be any player who is on the field including the goalkeeper. The captain will usually score double points, meaning that any of the points that he scores will be multiplied by two in that given game week. If your chosen captain fails to play in any match during that week, his vice will take over the captaincy and will score twice his points in that week. If they both fail to play during that week, the bonus points will be lost as no other player is eligible to receive the bonus. If any of your on-field players fails to play during that week, he will be automatically be substituted by an outfield player. This, however, is possible only if the player substituting the player during that week will only maintain a valid formation. You are therefore required to select an order through which the players will be selected during the substitution. For transfers, you have the option of making unlimited transfers until the deadline of the first week. Subsequently, you will only be allowed to make a substitution per week with extra substitutions leading to deductions in points during the match week. In the event that you don’t need to make the transfer, it will be rolled over to the following week and can only accumulate to two transfers. However, you can use the transfer wildcards, which give you unlimited transfers for players. Every half of the season has only one transfer, which is available during that half of the season. 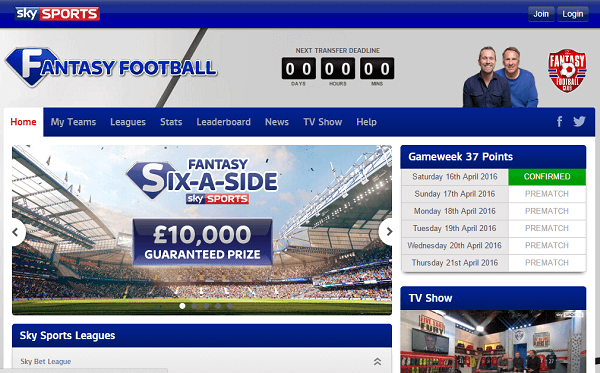 You have the opportunity of joining or creating leagues at the Sky Fantasy Football website. There are usually different types of leagues. 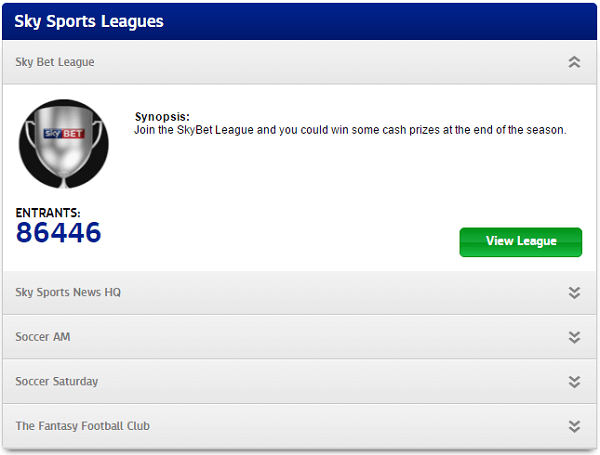 The overall league, which includes all the players, registered to the Sky Fantasy Football website. There is also a fantasy league where you are nominated according to the team(s) that you selected as your favorite when signing up. If you are an Arsenal fan, like I am, you shall be automatically be included in this league. You are only allowed to join up to five private leagues and three public leagues (which you are entered randomly). In the participant created leagues, the head-to-head or classic scoring systems might be used. The group administrator is usually the one responsible for selecting the scoring system. This is the most commonly used system where you and the other players are ranked according to the total points your Sky Fantasy Football team shall have accumulated at the game week. In each game week, your Sky Fantasy Football team will play against other participants teams within the same league with the winner being the player who’s team amassed more points during that game week. For a win, the team shall be awarded 3 points and for a draw, only a point shall be awarded. In the case of a tie during rankings, the goal difference is considered. The cup usually kicks off during game week 25. To qualify for the cup, only teams that shall be ranked among the top 1,500,000 worldwide will be considered. If there is a tie, a random draw amongst the last or lowest scoring teams shall be carried out to see the person who qualifies. During the first round, all the qualifying teams shall be drawn against each other. The winner will then progress to the next round where the team shall compete against another team with the losers being knocked out. The process continues until the final round where only two teams will compete for prizes which normally include cash and other valuables. In order to join the fantasy football league, you are required to have the Sky Fantasy Football League Codes. Either these codes can be found online, or you can ask the league administrator to provide it to you. Remember that each of the sky fantasy football league codes is unique to every league and therefore can’t be used in other leagues.